LulzStorm , Another Antisec supporter leaked Italian Universities dump database via a tweet on twitter. He release a torrent link and a Mediafire mirror link with a archive of 2.74 Mb. 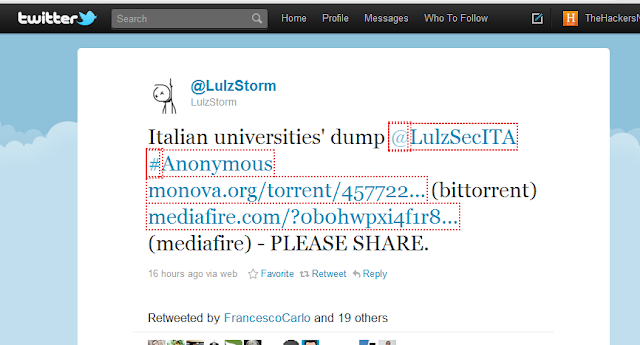 This Archive Include hacked database if 18 Italian Universities as listed : unisi.it, unisa.it, uniroma1.it, anotonianum.eu, econoca.it, uniba.it, unibocconi.it, unifg.it, unime.it, unimib.it, uniurb.it, unibo.it, unipv.it, unina2.it, unile.it, unito.it., unimo.it . The hack is in support of Operation Antisec. Today is a great day for us all, and a very bad one for italian universities. Their sites are full of weaknesses. Some of them even think being secure,so they don't mind hashing their passwordz.And you, Italian people, are giving all your data to idiots like these?Is it a joke?Change your passwordz, guys.Change your concept of security, universities.We could have leaked much more.We could have destroyed your db and your network.Were you ready for this?